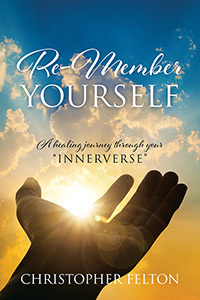 A healing journey through your "Innerverse"
Christopher Felton is a prolific Public Speaker, dynamic Writer, and competent Educator who has expansively taught about world Religions, Eastern philosophies, and Humanism. Christopher is hyper-creative and is best known for his extraordinary writing abilities, as he is able to transfer thoughts and reality onto paper. The author of two debut books, “Cipher’s Den” and “Remember Yourself” had been featured in “Her Times” magazine publication, which quickly revealed that his books and articles are embraced by readers of varied backgrounds. His articles have been broadcasted by a prison administrator as ‘inspirational’, his second book was reviewed by a Clinical Therapist as ‘working great for her patients’, and a celebrity figure sent him a letter of commendation and admiration for his ‘exceptional writing and thinking skills’. Christopher is a former Maryland State Trooper who was an expert sharpshooter. He was certified in pressure points tactics, control tactics, and defensive tactics. The renowned writer and public speaker is best known for utilizing his extraordinary and hyper-creative technique to captivate his readers, and summoning complete attention from the audience during his public speeches. He is a writer who bleeds his passion and breathes his truth. He is also a multi-talented personality who believes in projecting optimum effort in everything he does. However, with all of Christopher’s achievements, what he treasures most are the sentiments and tributes he has received from family, friends and colleagues – with the most notable being an essay written about him by his youngest son.